So, ask me in a month — no make that two months — how that project is going. One thing’s for sure, I bet there won’t be anymore crape myrtle blooms left! This entry was posted in Gardening and tagged crape myrtle on September 20, 2015 by Julie Riebe. That would be me taking care of that at my place, but to be fair I do all the landscaping. I tell ya, it’s getting harder and harder. I’ve taken care of it for too long and sometimes I think I need a smaller place. I am excited for spring, but know more mowing will be needed. Mowing is the easy part really. I push the lawnmower for about an acre and then riding mower for the other. It’s the in between that is time consuming and back breaking. When I plant trees, I will lay cardboard/newspaper around the tree and then lay a heavy ring of grass clippings and then mulch. No weeds pass through. And I can easily mow around that. I’ve had to come up with tricks as I want less work. I hope you find something you like to go around your crape myrtle. I love the blooms! I’d like to replace the ones already in the property with disease resistant kind. The type i have grow a white mold and every year I have to spray them with baking soda soap mixture. Otherwise the leaves shrivel up and look awful. No fun! I will try the cardboard and ring of grass clippings. Thanks for the idea! I probably should do the mowing and cut husband some slack. Who knows, maybe someday! Does hubs do the mowing? To make my mowing easier, I leave the mulch (I bring it out to 4-6 feet diameter) but outside that is a border of 6 inches of SOIL. Any grass invasion is easily managed with the lawn mower without tossing mulch into the blades. 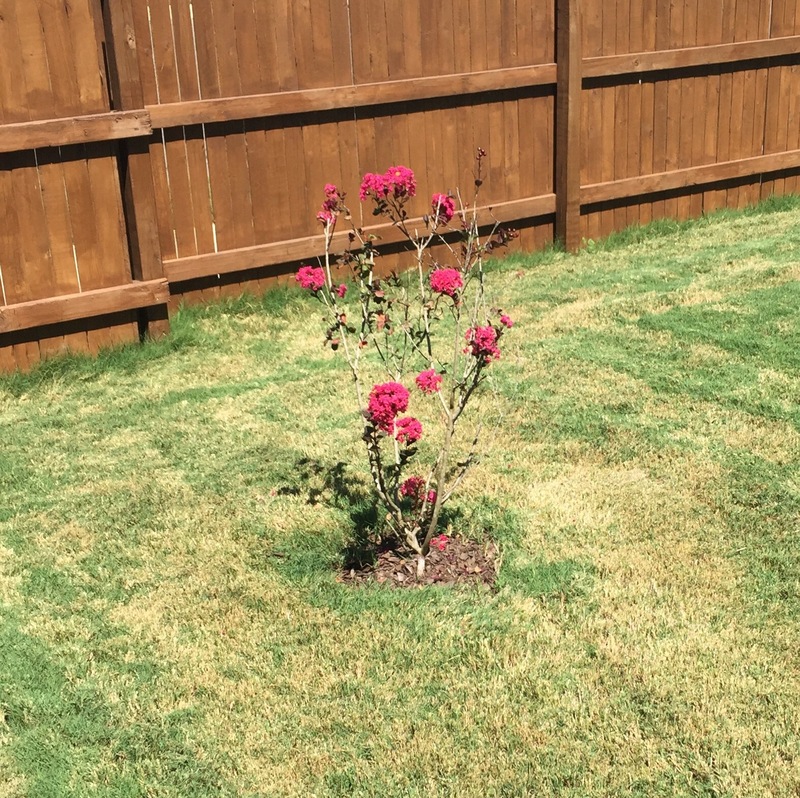 I only weed-whip my proper every 4-5 mows, so it works pretty well keeping things tidy but not maintenance intensive. My crepes think it’s spring! All the old leaves fell off and there’s new green and blossoms. So weird given everything else is shedding leaves. Interesting about the new blossoms. Last I checked I didn’t have any new ones, but I’ll have to look again.